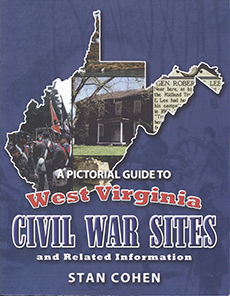 A Pictorial Guide to West Virginia Civil War Sites is a classic and comprehensive collection of Civil War history—a must-have for Civil War buffs and historians alike. The book contains photographs and historical data for over 230 of the state\'s Civil War sites—ranging from historic houses, buildings, and monuments to inspiring battlefields and poignant cemeteries. The sites are organized in the book by county. Each entry contains the location of the site. Most entries also contain either a contemporary photograph of the site or a historical image, or both. A study of these sites begins to portray the harrowing period that was instrumental in West Virginia\'s formation in 1863. This guidebook is a valuable tool for understanding the events that shaped West Virginia in the momentous years of our nation\'s darkest days and greatest conflict, the Civil War. 8.5 x 11, SB, 158 pages, over 300 b&w photos.